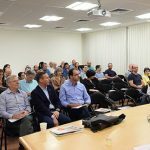 Last week, Shaare Zedek Medical Center hosted a workshop for radiologists from across the country along with experts from around the world focused on the impact that new Dual Source CT Scanners are having on the treatment of patients. 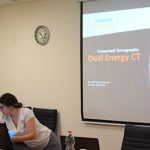 Shaare Zedek Medical Center’s Imaging Department was the first hospital in Israel to start using the Dual Source CT Scanner, Somatom Force. 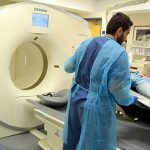 This is an advanced system which scans patients with an array of different issues including strokes or other life-threatening emergencies, in a fraction of a second, gives off less radiation and requires less contrast media. This CT scanner provides superior images in half the time as the older scanners. In-patient and ambulatory patients benefit from the new device which actually contains two scanning units in one. As a result, the exam is so fast that heart patients do not require prepping with beta-blockers and children do not need to be sedated. Thank you to USAID/Office of American Schools and Hospitals Abroad for their support in acquiring this cutting edge technology.